With the election settled, investor attention has turned to efforts to address the automatic tax hikes and spending cuts set to be triggered at the start of January. Domestic equities rose slightly in November with large cap stocks outperforming smaller companies. International equity markets also posted monthly gains, leading domestic equities. Developed market equities outperformed emerging market shares. The domestic fixed income markets rose modestly in November, as investors looked for safety in bonds on uncertainty over budget negotiations. Global equity markets rose in November despite a turbulent month in which investors shifted their focus from the presidential election to worries over the year-end budgetary negotiations aimed at avoiding the so-called "fiscal cliff." Concern centers around the possibility that the automatic tax hikes and spending cuts set to take effect on January 1 threaten to derail economic growth and potentially push the U.S. economy into recession. While it is unlikely that a deal will be reached before year-end, some sort of compromise is expected in the months ahead. Ideally, this compromise would spread out spending cuts over several years, ensuring that long-term fiscal issues are addressed while also providing the U.S. economy more time to achieve sustainable growth. A deal returning the U.S. to a more tenable level of deficit spending over the next five years or so would likely provide more stability to equity markets. That said, there have also been a number of positive economic reports in recent weeks, including upwardly revised gross domestic product (GDP) metrics and encouraging news for the housing market. Modest economic growth in the U.S. appears to be increasing at the fastest pace in over a year as GDP data for the third quarter was upwardly revised from 2.0% to 2.7%. While this revision is significant, a key factor in the uptick was a buildup of inventories by businesses—a dynamic typically associated with lower-than-expected demand for goods. Coupled with a decrease in business spending due to fiscal uncertainty, this overhang of inventories could result in subdued growth in the fourth quarter. Another encouraging measure of economic growth was the most recent Beige Book report issued by the Federal Reserve. This report showed that all Fed districts experienced modest levels of economic activity. Consumer spending increased across the board, and a majority of districts showed increased hiring, albeit amid a manufacturing contraction. The Fed's efforts to keep mortgage rates low appear to be helping the housing market, as encouraging news continues to emanate from the sector. In October, sales of previously owned homes climbed 2.1% on a month-to-month basis—and 10.9% year over year. Also, the median selling price from a year earlier rose over 11%. This was the eighth consecutive monthly increase in year-over-year sales, a winning stretch not seen since the peak of the housing bubble in 2005–2006. Despite falling after the election, U.S. stocks rallied in the second half of November to end the month with a slight gain. This came as investors were encouraged that U.S. lawmakers may reach a budget deal. The S&P 500 rose 0.58% in November and is up almost 15% year to date. 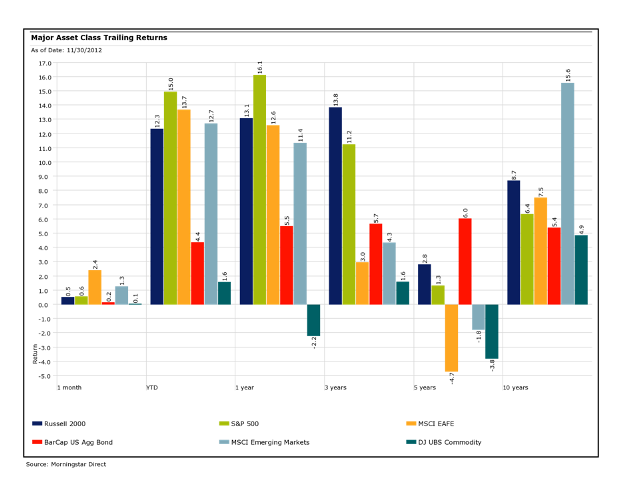 Equity sector performance for the month was mixed with a wide spread in returns between best and worst performers. The strongest results were seen in the economically sensitive consumer discretionary, materials, and industrial sectors. At the same time, the weakest results (all negative for the month) were posted by the historically defensive utilities and telecom sectors. Year to date, all sectors remain in positive territory. Return dispersion, however, is notable—with the best returns seen in consumer discretionary, financial, and telecom stocks. The utilities, energy, and materials sectors have posted the weakest relative returns for the year. Large cap stocks slightly outperformed small caps for the month as the Russell 2000 Index rose 0.53%. Year to date, small caps have posted a return of 12.4%, trailing the S&P 500. In terms of equity market style performance, growth stocks outperformed their value counterparts in November across all market capitalizations. On a year-to-date basis, growth also leads value, as many investors continue to favor sectors that are expected to grow revenues and earnings at a faster rate than the broader economy. We expect headline-driven market volatility to persist into the foreseeable future. However, assuming a budgetary agreement is reached by early 2013, it is likely that U.S. stocks will be well positioned for further gains. Continued job growth along with improvement in the real estate markets could help boost consumer confidence and spending and ultimately benefit equities. International equities rose in November and outpaced domestic stocks. Despite the rebound international shares have staged in recent months, they still trail U.S. stocks on a year-to-date basis. Developed market gains in November were largely the result of investor optimism that a budget deal would be reached in the U.S. The largest gains were seen in European and Japanese stocks. Emerging market equities rose in November but could not keep pace with developed markets. Year to date, emerging markets are up 12.7%, also lagging developed markets (at 13.7%). While Europe's debt crisis continues to contribute to market volatility and questions about a euro zone breakup linger, there has been some recent positive news from Europe. Officials there have said they would cut the rates on Greek bailout loans, suspend interest payments, give Greece more time to repay, and engineer a bond buyback. The focus has now shifted to Spain, as investors question if the country will formally seek a bailout to address its fiscal concerns. If this occurs, it would likely be a welcome development for investors. Progress in Spain could be seen as a key step toward resolving the overall European crisis. Turning to China, investors are still closely watching to see if growth in the country will rebound after seven quarters of declines. With a once-a-decade leadership transition now complete, China's new leaders will likely push ahead with overhauling state-owned enterprises and urbanization policies. These moves are intended to boost domestic consumption, thus lessening the country's reliance on exports. The broad domestic fixed income markets posted modest gains in November with the Barclays U.S. Aggregate Index returning 0.16% for the month. Year to date, the index is up 4.4%. The U.S. Treasury yield curve flattened for the month with the largest decline in rates taking place in the intermediate range. Moving inversely to yields, Treasury prices rose for the month. The yield on the benchmark 10-year note fell in November and ended the month at approximately 1.62%. With uncertain conditions likely to persist over the coming weeks (or even months) due to congressional budget negotiations, investors will probably continue to look to Treasuries as a safe haven from market volatility. However, for longer-term investors, the negligible and likely negative real return (net of inflation) expected from Treasuries make them potentially unsuitable. That said, regardless of the current low-yield environment, bonds still play an essential role in an investment portfolio. Investors should not abandon Treasuries and bonds, as these investments are likely to continue to reduce overall portfolio risk by counterbalancing the volatility of equities. Fixed income investments can provide liquidity to a portfolio and serve as a hedge against the future uncertainty of domestic and global events. With investors focusing on domestic budgetary negotiations at year-end, we see the broader economic environment improving modestly. We expect headline-driven market volatility to persist into 2013 as many of the challenges facing investors in recent years remain in place, including historically high unemployment. With several weeks left in the year, the U.S. equity markets appear poised to produce a fourth consecutive year of positive returns. While many retail investors abandoned the markets in the wake of the financial crisis, those who remained have likely been rewarded for their perseverance. Taking such a long-term view isn't always easy. But as we've noted in the past, an effective way to stay the course is to hold a well-diversified portfolio aligned with one's personal objectives and circumstances. This approach can help investors manage overall portfolio risk, allowing them to confidently weather inevitable market volatility. The end of the year is also an ideal time to perform some portfolio housekeeping. For instance, you can take this opportunity to assess whether your portfolio is still aligned with your personal goals and risk tolerances. If your situation hasn't changed and your current strategic asset allocation remains appropriate, consider rebalancing your portfolio to its target proportions when significant deviations have occurred. Repositioning assets that have performed well and deploying those proceeds to underperforming assets can help ensure that your overall risk is aligned with your investing goals and personal circumstances.